The most visible leveling mechanic in Pokémon GO is the Trainer Level. Trainer Level has a little progress bar in the bottom-left corner of the screen which increases with every action you take in the game. 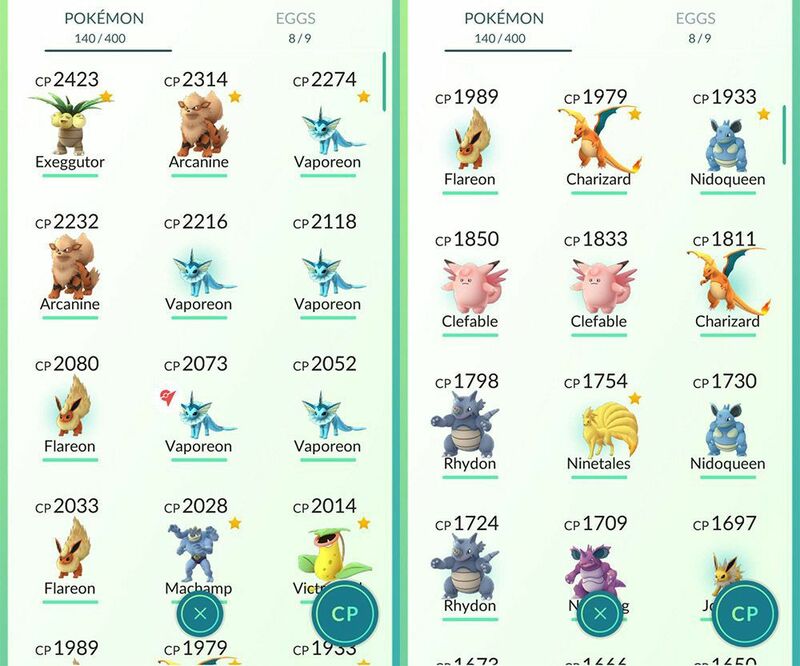 However, hidden under the hood in Pokémon GO, each Pokémon has its own separate Level as well. Find out more about this invisible level (which is separate from CP) and learn how to increase it. Combat Points provide an at-a-glance idea of how strong a Pokémon is in battle. It is important to the mechanics of the game because Pokémon are ordered by strength in Gyms based on this value. Some people ask why the developers decided to make the CP so visible instead of the more familiar Level mechanic. Here are some of the reasons why. A Pokémon with a CP that is too low is the first to be booted from a Gym, so this CP value had to be accurate. While CP calculations aren’t perfect, the CP definitely depicts a Pokémon’s strength much more accurately than Level does. For example, a Weedle and a Charizard can both be level 40, but that doesn’t mean that they are equivalent in fighting prowess. The system in Pokémon GO conveniently takes all these statistical differences into account, and wraps it all neatly into one number. There are three stats found in GO: Stamina (HP), Attack, and Defense. From data-mining, we know all of the base values for each Pokémon. Charizard has a base Stamina of 156, an Attack of 212, and a Defense of 182. Weedle, meanwhile, sits at 80 Stamina, 68 Attack, and 64 Defense. Even if these two Pokémon are the same level, their strength will be wildly different due to their base stats. If you sort your Pokemon by CP, you see a Pokémon’s true strength. If you could instead sort by Level, you would still have that much more mental sorting to do. In this regard, the CP system is very helpful, and far superior. 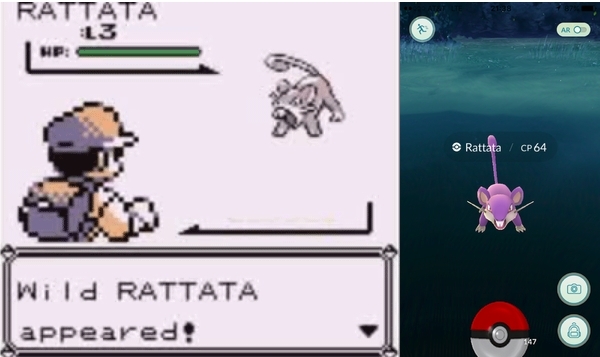 When you encounter a wild Rattata in the main-series games, all that you see of that Pokémon’s strength is that the Pokémon is a Rattata, and that the Rattata is Level 3. To a newcomer to the game, that leaves a lot unseen (How strong is a Rattata compared to other Pokémon, exactly? ), and only having that one number in such a small range displayed leaves very little space to better differentiate between different Pokémon. In Pokémon GO, the range of possibilities is expanded to one that stretches well into the thousands. This gives you a much larger number of differentiating steps to get excited about than a system that only spans 1-100. It adds more of that real-world aspect to the game, where there aren’t only 100 different strength levels, there are near-infinite levels of skill. For example, this Rattata has a CP of 64. It is a relatively weak Pokémon, but there are still 54 different CP values that it could potentially have that would be even weaker. And since the maximum-CP Rattata that can possibly currently be found in the wild has a CP of 498, there is an insanely large range of different higher-valued CPs that it could have. But, as we mentioned, regardless of the main mechanic being Combat Points (CP), traditional Pokémon Level still exists and has a very important place in the game. When you tap on a wild Pokémon on the main map, but before you actually see the Pokémon in the encounter screen, the wild Pokémon is randomly assigned a Level. This Level is assigned for you personally, which is why sometimes when you are walking around with a friend, you will both tap the same Rattata and yours will be CP 10 while theirs is CP 400. Your Rattata might’ve been randomly assigned the number 1 for its Level, while your friend’s Rattata may have been randomly assigned the number 30. The range of numbers that a Pokémon can have randomly assigned to it must be at or below your current trainer Level. That is why you encounter stronger Pokémon as your Trainer Levels up, and why everyone’s first Pokémon caught at Trainer Level is always at Pokémon Level 1. The only thing that changes is the range of potential numbers that it can be assigned for its Level. The biggest visual indication of a Pokémon’s Level is the curved arch that appears above its image on the page for that Pokémon. The arch looks different for each Trainer Level. A Level 1 Pokémon will always have the arch completely to the far left of the arch, as if the arch hasn’t been filled whatsoever. A Pokémon who is the same level as the Trainer will have the arch filled almost all of the way. Pokémon with a Level somewhere in-between will accordingly have the arch filled somewhere in-between. The progress of the arch isn’t evenly distributed for each level, so a Pokémon with half the trainer’s Level usually won’t have the arch filled halfway. The highest Pokémon Levels that a Pokémon can attain at the given Trainer Level are bunched tightly together at the end. So if you are a Level 20 Trainer, the arches for a Level 19 and Level 20 Pokémon will look very similar, while the arches for a Level 2 an Level 3 Pokémon will look distinctly different. There are many resources to help you interpret what Pokémon Level the arch indicates for your given Trainer Level. My favorite is found in the IV rater over at The Silph Road. A Pokémon’s level determines how much of its potential it is allowed to fulfill. It limits how strong it is now, compared to how strong that same Pokémon potentially could be. It is currently the only thing that you can change about a Pokémon’s fighting ability once you have caught it. We have mentioned that every Pokémon only has three types of stats in the game: Stamina, Attack, and Defense. Each of those three stats is comprised of three things: Base Stats, Individual Values, and Level. We have mentioned Base Stats above, which are the same throughout every species of Pokémon. (Every Bulbasaur has the same Base Stats as every other Bulbasaur.) We will not delve into Individual Values here, which have a minimal effect that can cause one Bulbasaur to be a little stronger than another. But our focus is on Level. Once the Base Stats and IVs have been added together, the main thing that determines the CP of a Pokémon is its Level. 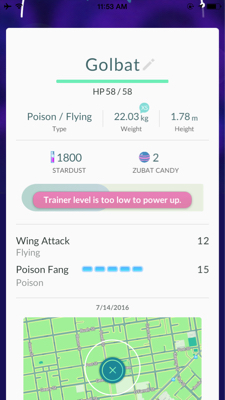 Each stat for the Pokémon is modified according to its current Level. This CpMultiplier value was found in the code as bunch of float32 arrays, which we have translated for you. A chart of these values is shown to the left, showing all of the modifiers for every level. If you have a Level 1 Bulbasaur, all of its stats will be multiplied by 0.094, and lowered to less than a tenth of what they otherwise would have been. A Level 3 Bulbasaur will be more than twice as strong as a Level 1 Bulbasaur, and a Level 11 Bulbasaur will be twice as strong as that. The current Trainer Level Cap is set at 40, which means that Pokémon can currently only reach as high as 79% of their Base Stats, as they are constricted by their Level. As we reported back on June 7th, (a month before the game released,) it is possible for you to increase the Level of your Pokémon by using Stardust and Candy to Power Up. We have learned much more information since this outdated beta article. We now know that every time that you Power Up, the only affect that it has is an increase of 0.5 to your Pokémon Level. This means that you must Power Up your Pokémon two times to increase it by one Pokémon Level. The maximum that you can Power Up your Pokémon is to 1.5 Levels above your current Trainer Level. After that point, you will receive the error message seen here, warning that you cannot Power Up the Pokémon further until you get a higher Trainer Level, yourself. Ensuring that a trainer’s Pokémon Level always stays below their own Trainer Level is how the game maintains a system of progression that makes sense. You have to get stronger one level at a time, in order for your Pokémon to get stronger. In the main-series games, this goal was accomplished by Gym Badges. If a Pokémon was stronger than it should be for the number of Gym Badges that you had managed to obtain, it might not listen to you in battle. When trading is released, I imagine that you might not be able to trade someone a Pokémon that has a Level higher than their own Trainer Level. Many people have asked whether it is better to Power Up before or after Evolution. Hopefully, you can see now that it makes no difference. All that a Power Up does is increase the Level. The Level will stay the same after evolution. Powering up can be done before and after with no difference in its effectiveness. There is also no difference in cost, as the Power Up only determines the cost based on the current Level. (It does not matter if the Pokémon is evolved or not.) The Power Up cost increases with every 2 Pokémon Levels. A list of these Power Up costs is provided to the right. Hopefully this helps you understand Individual Pokémon Level a little better. One of the most exciting parts of Pokémon GO right now is, staying true to the spirit of the series, there are so many secrets about the games waiting to be uncovered. While we have spent enough time with the main-series games to have largely broken them apart, there is still so much research and investigation to be done on exactly how Pokémon GO works. Why do Pokémon spawn in the places that they do? How are they assigned the traits that make them the way that they are? Stay with us as we seek to learn more about these things together, and comment below if you have anything to add.